German cockroaches are a common type of indoor bug which can be found around the world, as well as in Las Vegas, Nevada. Whereas German cockroaches have a tan or light brown color and are around 13-16 mm long, young cockroaches are almost black. If you have seen such cockroaches in or around your home, which have two black horizontal stripes behind their head, then it’s possible you might have a German cockroach problem. To have your home inspected and know for certain, or to get answers to your questions, give us a call today at (702) 871-1211. These type of cockroaches are the fastest reproducing due to their egg cases which each holds 20-40 eggs, and short reproductive cycle of 17-28 days. A German cockroach infestation can span from hundreds of bugs to thousands within a few months of them reproducing freely. Unlike regular cockroaches, which one typically thinks of American and Oriental cockroaches, German cockroaches are extremely resilient. They can live in ovens and dishwashers, and even motors of appliances. They can live in microwave component compartments, telephone, and many other small and hard to reach areas. German cockroaches can also sustain their exponential growth since their food source is readily available through the rust or oily residue of metal hinges and motor components. Whereas typical cockroaches die without a constant food source, German cockroaches often have a ready food supply and will continue to reproduce. To correctly identify an infestation and offer effective pest control, we have to understand the German cockroach and its behavior. For starters, it’s important to know that while German cockroaches are capable of living outside, they are usually found inside due to the optimal warmth and humidity this bug desires. German cockroaches can be found in any area of a home, but they will typically nest in kitchens and bathrooms due to the moisture and food source that they find there. In fact, German cockroaches can even feed off of toothpaste, soap, and other miscellaneous compounds. They will eat the smallest of crumbs and also eat from dirty dishes left in sinks overnight. Most homeowners find themselves invested with German cockroaches a few weeks after they enter the home through structure flaws, or when brought into the home with bags or boxes. Since German cockroaches live in appliances, even brining in a used appliance could make a German cockroach migration into your home possible. Apartments have it the toughest since the hollow spaces between them are connected, as are plumbing and other pipes, making it extremely easy for German cockroaches to spread and extremely hard for residents to keep them away. When it comes to the reproduction habits of German cockroaches, they only need to mate once and the female will be able to produce four to six egg cases throughout its life. Each egg case holds 20-40 eggs, and the average time it takes for an egg to hatch and develop into an adult German cockroach is 100 days. German cockroaches then typically live 100 to 200 days as adults. Before infestations become obvious due to growing appearances of cockroaches, you can tell that you might have a cockroach problem if you see small droppings on countertops or in drawers. Such droppings in the crevices of walls or corners of them is also an indication that something is not right and an inspection is advised. When a lot of cockroaches are present in an area, yet you cannot see them, you may be able to smell them as some have described by a musty odor. 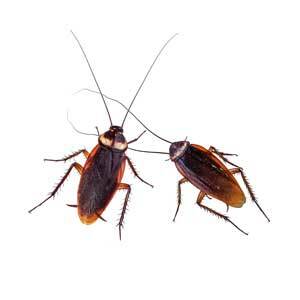 If you’re seeing droppings or German cockroaches in your home, we can help identify and fix your bug problem. These bugs have been in existence for millions of years and are extremely resilient when it comes to them being able to survive off any organic food source, and their fast reproduction cycle. However, these bugs are no match when it comes to Ace Pest’s control specialized treatment for effective extermination of infestations. While German cockroaches may be resilient, they are no match for our skills and pest control techniques. Don’t let your pest issue become a big problem. At Ace Pest Control we offer free consultations and estimates, so give us a call today at (702) 871-1211.